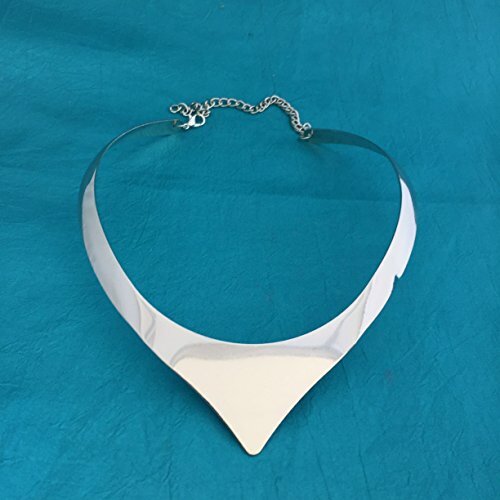 This set of 2 unique necklace collar forms will set the stage for your beautiful creations. Overlay your polymer clay designs on these metal forms and remove after baking or cover them completely as an armature for extra stability. There is one smooth which is the plain v necklace and one with a bumpy finish which is the split one. So many possibilities! If you have any questions about this product by Create Along with Polymer Clay TV, contact us by completing and submitting the form below. If you are looking for a specif part number, please include it with your message. Cabtopia -- Jewelry Design Template Stencil "Flower #1"
Cool Tools - Flexible Mega Tile - Blooming Hearts - 9.25" X 6"
Cabtopia -- Lapidary Jewelry Design Template Stencil "Hope"
Cabtopia -- Lapidary Jewelry Design Template Stencil "Endure"
Cabtopia -- Lapidary Jewelry Design Template Stencil "Strength"
Cabtopia -- Lapidary Jewelry Design Template Stencil "Flare"
Cabtopia -- Jewelry Design Template Stencil "Earring #1"
Cabtopia -- Lapidary Jewelry Design Template Stencil "Torrent"
Cabtopia -- Lapidary Jewelry Design Template Stencil "Action"